Pasadena ISD administrators, faculty, staff, and volunteers visited homes of De Zavala Middle and Jackson Intermediate students during the first annual Path to College walk on Saturday, Oct. 12. Pictured here: Jackson Intermediate employee Maria Cortes and Associate Superintendent of Campus Development Steve Laymon. The dismal weather did not dampen the spirits of volunteers who went door-to-door in the De Zavala and Jackson Intermediate community during the first annual Path to College walk. Sponsored by Houston A+ Challenge, a local non-profit educational foundation, the School Path to College walk was part of an on-going Pasadena ISD initiative aimed at increasing parent engagement and expanding educational opportunities for students early on. The event attracted over 200 Pasadena ISD administrators, faculty, staff, students, and community volunteers who flooded the cafeterias at Jackson Intermediate and De Zavala Middle bright and early Saturday morning, ready to meet parents in the neighborhood to talk about college opportunities available for students soon to be entering high school. Teams of district representatives reached out to over 500 families - each completing parent surveys for every home visited. Volunteers also distributed information about college preparatory programs. Judging from the smiles on parent’s faces, it was obvious that Path to College volunteers brightened their day. 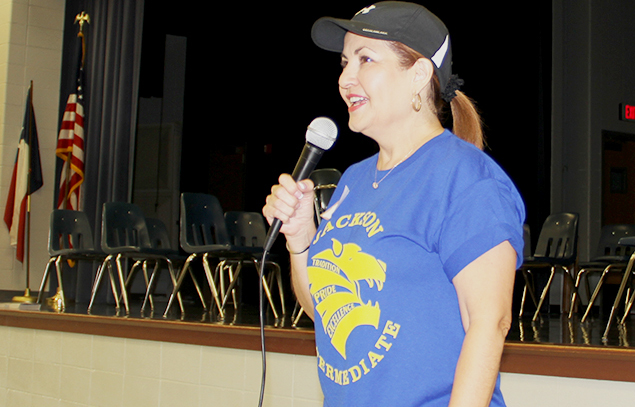 Gloria Gallegos, Pasadena ISD associate superintendent of special programs, prepares volunteers for the walk during the Path to College orientation.